The stock market is on a tear. The S&P 500 rose 19.4% in 2017 excluding dividends, and is already up over 4% in 2018. It’s not a bubble or a sugar high. Our capitalized profits model, says the broad U.S. stock market, is, and was, undervalued. We never believed the “sugar high” theory that QE was driving stocks. So, slowly unwinding QE and slowly raising the federal funds rate, as the Fed did in 2017, was never a worry. But, now a truly positive fundamental has changed – the Trump Tax Cut, particularly the long-awaited cut in business tax rates. With it in place, we think our forecast for 3,100 on the S&P 500 by year-end is not only in reach, but could be eclipsed. Before you consider us overly optimistic, we did not expect the stock market to surge like it has so early in the year. In fact, we would not have been surprised if the market experienced a correction after the tax cut. There’s an old saying; “buy on rumor, sell on fact.” So, with tax cuts approaching, optimism could build, but once they became law, the market would be left hanging for better news. We would never forecast a correction, because we’re not traders. We’re investors. Anyone lucky enough to pick the beginning of a bear market never knows exactly when to get back in. In 2016, it happened twice and we know many investors are still bandaging up their wounds from being whipsawed. The market got off to a terrible start in 2016, one of the worst in years. The pouting pundits were talking recession and bear market, only to experience a head-snapping rebound. Then, during the Brexit vote, the stock market fell 5% in two days – which was seen as another indicator of recession. But, it turned out to be a great buying opportunity, like every sell-off since March 2009. The better strategy for most investors is don’t sell. Some sort of correction is inevitable but no one knows for sure when it will happen and few have the discipline to take advantage of the situation. This is particularly true when risks to the economy remain low and the stock market is undervalued, which is exactly how we see the world today. Earnings are strong (even with charge-offs related to tax reform), and according to Factset, since the tax law passed analysts have lifted 2018 profit estimates more rapidly than at any time in the past decade. Even the political opponents of the tax cuts are saying it will likely lift economic growth for at least the next couple of years. Continuing unemployment claims are the lowest since 1973, payrolls are still growing at a robust pace, and wages are growing faster for workers at the lower end of the income spectrum than the top. Auto sales are trending down, but home building has much further to grow to keep up with population growth and the inevitable need to scrap older homes. Consumer debts remain very low relative to assets, while financial obligations are less than average relative to incomes. In addition, monetary policy isn’t remotely tight and there is evidence that the velocity of money is picking up. Banks are in solid financial shape, and deregulation is going to increase their willingness to take more lending risk. The fiscal policy pendulum has swung and the U.S. is not about to embark on a series of new Great Society-style social programs. In fact, some fiscal discipline on the entitlement side of the fiscal ledger may finally be imposed. Bottom line: This is not a recipe for recession. It’s true, rising protectionism remains a possibility, but we think there’s going to be much more smoke than fire on this issue, and that deals will be cut to keep the good parts of NAFTA in place. Put it all together, and we think the stock market, is set for much higher highs in 2018. If you’re brave enough to attempt trading the inevitable ups and downs of markets, more power to you, but as hedge fund performance shows, even the so-called pros have a hard time doing this. Stay bullish! We have been talking about the “Plow Horse Economy” for quite a while now. Low interest rates designed to spur economic growth have been offset by other government policies that have acted as a “Plow” holding the economy back. Market watchers have assumed that the November election would see a continuation of those policies. The general prediction was for slow growth, falling corporate profits, a possible deflationary spiral, and flat yield curves. What a difference a week makes. The market shocked political prognosticators by standing those expectations on their heads. Bank of America surveyed 177 fund managers in the week following the elections who say they’re putting cash to work this month at the fastest pace since August 2009. The U.S. election result is “seen as unambiguously positive for nominal GDP,” writes Bank of America Merrill Lynch Chief Investment Strategist Michael Hartnett, in a note accompanying the monthly survey. The stock market has reached several new all-time highs, moving the DJIA to a record 18,924 on November 15th, up 3.6% in one week. Interest rates on the benchmark 10-year US Treasury bond have risen from 1.83% on November 7th to 2.25% today (November 17th), a 23% increase. Expectations for the yield curve to steepen — in other words, for the gap between short and long-term rates to widen — saw their biggest monthly jump on record. Global growth and inflation expectations are also tracking the ascent of Trump. The net share of fund managers expecting a stronger economy nearly doubled from last month’s reading, while those surveyed are the most bullish on the prospect of a pick-up in inflation since June 2004. Investors are now also more optimistic about profit growth than they have been in 15 months. Whether this new-found optimism is justified is something that only time will tell. In the meantime to US market is reacting well to Trump’s plans for tax cuts and infrastructure spending. Spending on roads, bridges and other parts of the infrastructure has been part of Trump’s platform since he entered the race for President. It’s the tax reform that could be the key to a new economic stimulus. According to CNBC American corporations are holding $2.5 trillion dollars in cash overseas. That’s equal to 14% of the US gross domestic product. If companies bring that back to the US it would be taxed at the current corporate tax rate of 35%. The US has the highest corporate tax rate in the world. The promise of lower corporate tax rates – Trump has spoken of 15% – could spur the repatriation of that cash to the US, giving a big boost to a slow growth US economy. The general election is over and the people have spoken. Donald Trump will be the 45th President of the United States. The run-up to November 8th has shown that our country is sharply divided politically. Some people will be happy and others disappointed by the result. However, it’s important to avoid letting your personal political beliefs and emotions cloud your long-term investment decisions. Our job as your financial advisor is to help you navigate your way through the upcoming economic and political changes. Forecasters can be wrong, and we have seen that pollsters can be too. We avoid making big bets based on crystal ball gazing. So how do we see the future? As students of history we think that countries that keep their governments relatively small, in terms of spending, regulation, and tax rates, will provide their residents with an advantage in pursuing financial prosperity. Regardless of who won this year’s election, we think that economic growth in the U.S. will generally continue, even with the policy mistakes the winner may make. Since 2009, we have experienced what we’ve been referring to as a “Plow Horse Economy.” That means that the macro-economy has gradually recovered even as many people have not seen much of an improvement in their individual economic lives. The overall economy has grown despite the fact that debt, regulation and political turmoil have acted as a “Plow” holding the economy back. Despite this drag, the major U.S. stock indexes are up almost 50% over the past four years. We remain constructive on the economy and the markets. With the election in the rear view mirror, we expect the Federal Reserve to begin its long, slow walk to raising interest rates from today’s near-zero percent. We expect those moves to be very gradual and to have little long-term effect on the market. One other statistic makes us optimistic for the future. Consumer spending is said to account for 70% of the U.S. economy. Unfortunately, that vast middle class that we think of as the “average consumer” has not seen much in the way of a fatter wallet over the last few decades. That was one reason for the popularity of Trump’s message to the middle class that he would restore good paying middle class jobs. We believe that if he is able to follow through on this promise, a resurgence of earnings growth by the middle class will be a positive for the American economy, and hope that he is able to implement feasible policies to promote such growth. A well-diversified portfolio typically includes emerging markets as one of its components. “Emerging markets” is a generic term to identify those countries whose economies are developed, but still smaller than those of the world’s superpowers (i.e., USA, Europe, Japan). To professional investors, a well-diversified portfolio includes many asset classes, not just the most obvious: U.S. Stocks (the S&P 500) and a U.S. bond fund. The following illustration is a great illustration of the relative performance of some of the major asset classes. Here we have ten key indices ranked by performance over a 20-year period. The best-performing index for each year is at the top of each column, and the worst is at the bottom. It is natural for investors to want to own the stock, or the asset class that is currently “hot.” It’s called the Bandwagon Effect and it’s one of the reasons that the average investor typically underperforms. The top performer in any one year isn’t always the best performer the next year. Rebalance your portfolio once or twice a year to keep your asset allocation in line, essentially forcing you to sell what’s become expensive and buy what’s become cheap. In other words, re-balance your portfolio regularly and you will benefit from the fact that some assets become cheap and provide buying opportunities and some become expensive and we should take some profits. Which brings us to emerging markets, which have been a drag on the performance of diversified portfolios for several years. “It was a summer of love for investment in emerging markets,” according to the latest MSCI Research Spotlight. For example, Brazil, Taiwan, South Africa and India have all been big winners, MSCI said. The MSCI Emerging Markets Index ended August up for the year 15 percent compared to a loss of 20 percent the prior year. “We are seeing very strong performance,” Martin Small, head of U.S. i-Shares BlackRock, told the conference. For investors who have included emerging markets in their portfolios, their patience and discipline is being rewarded this year. For those who want to have a portfolio that’s properly diversified but don’t have the expertise to do it themselves, give us a call. One of our favorite market analysts, Brian Wesbury – who coined the term “Plow horse Economy” to describe the current economic situation – has been accused of being a “perma-bull” because he had discounted all the predictions of recession over the last 7 1/2 years. We can understand why people are concerned about recessions because 2008 is still fresh in our minds. The recovery that began in 2009 has been anemic. Millions of people have not seen their financial situation improve. Remember fears about adjustable-rate mortgage re-sets, or the looming wave of foreclosures that would lead to a double-dip recession? Remember the threat of widespread defaults on municipal debt? Remember the hyperinflation that was supposed to come from Quantitative Easing? Or how about the Fiscal Cliff, Sequester, or the federal government shutdown? Or the recession we were supposed to get from higher oil prices…and then from lower oil prices? How about the recession from the looming breakup of the Euro or Grexit or Brexit? None of these things has brought on the oft-predicted recession. Wesbury says that at some point a recession will come. We have not reached the point where fiscal or economic policy has eliminated that possibility. He mentions several indicators, including truck sales and “core” industrial production as indicators that should be watched. Job growth continues at a healthy clip. Initial unemployment claims have averaged 261,000 over the past four weeks and have been below 300,000 for 80 straight weeks. Consumer debt payments are an unusually low share of income and consumers’ seriously delinquent debts are still dropping. Wages are accelerating. Home building has risen the past few years even as the homeownership rate has declined, making room for plenty of growth in the years ahead. Meanwhile, there haven’t been any huge shifts in government policy in the past two years. Yes, policy could be much better, but the pace of bad policies hasn’t shifted into overdrive lately. In other words, our forecast remains as it has been the past several years, for more Plow Horse economic growth. But you should never have any doubt that we are constantly on the lookout for something that can change our minds. While the next recession may or may not be right around the corner, serious investors should be prepared for the eventuality so that when it does arrive, they will be ready. We invite your inquiries. The latest issue of Wealth Management magazine dealt with the upcoming election. One of the more interesting things about our recent presidential election (and it’s a long list) is that the traditional political battle lines have not only moved, they’ve been decimated—broken into such unrecognizable shapes that the head spins. What the Editor found interesting is that neither candidate projects warm feelings toward Wall Street for different reasons. For both parties and their supporters, Wall Street, and by extension financial services, is to be viewed with deep suspicion and skepticism. The editor finds this troubling. We’re not so sure. When you turn your financial affairs over to another there has to be a certain level of trust. However that trust must be reinforced over time and “Wall Street” has done enough damage to the trust that people have placed in it that it deserves to be viewed with suspicion and skepticism. Trust is generated when promises made are promises kept. The problem is that too often the promises that the major Wall Street firms have made were deceptive. Wall Street firms like to pretend that they have the best interests of their clients in mind. The truth is that the firms view their clients as customers and their brokers as the sales force. The object is to generate commissions via the sales of products created to generate profits for the firm. And if it benefits the client, that’s nice but it’s a by-product of the sales effort. That’s why the growth of independent Registered Investment Advisory firms has been a good thing for people seeking investment advice that they can trust. RIAs who charge fees for their services are not compensated for selling Wall Street products. Because they work for their clients, not for Wall Street firms, they do not have divided loyalties. They are supposed to be fiduciaries, not salesmen. Not to say that there are no bad apples in the basket, but the vast majority of them will work to earn your trust. Does the Bull Market Have Room to Run? From time to time we share the thoughts of prominent stock market analysts. As the markets reach new heights, we scour the headlines and find prophets of gloom and doom just about everywhere. We are by cautious by nature, but not given to hyperbole. Now, the pessimists can’t stop talking about profits. Both S&P 500 reported earnings and the government’s economy-wide measure of corporate earnings are down 4.9% from a year ago. In hindsight, corporate profits peaked in 2014, just like they did in 1978, 1988, 1997, and 2006. So, they say, a recession and bear market are on the way, just like the ones that followed those peaks in profits as well. It’s time to sell, again! One problem with this theory is that it assumes the decline in profits is permanent. But profits have been hurt by the downdraft of energy prices, which crushed profits in that sector, while also hurting other related businesses. However, energy prices are rebounding while profits outside of energy are accelerating. In addition, the ingredients for a recession are not yet there. Monetary policy is not tight, consumer and corporate balance sheets are healthy, and the recovery in home building has much further to go. None of this means the stock market must go up today, or this week, or even in the year ahead. But it does bolster our case for a continuation of the bull market. Quite an alternate view from many of the talking heads on CNBC. If Wesbury is indeed right, the Bull Market has room to run. In the meantime we’ll continue to invest with caution. Like the Boy Scouts, we’re always prepared. No one rings a bell when the market turns and we want to be positioned so that we will not be blindsided when it does. If you are uncertain about what to do, contact us. We’ll be glad to help. According to Bloomberg writer Ben Steverman, Baby Boomers – “part of the wealthiest generation in U.S. history” – just keep getting richer. The Boomers started turning 65 in 2011 and since then the S&P 500 Index is up 91 percent. That’s fortunate because the worst thing that can happen to a retiree is for his retirement investment portfolio to decline just as he retires and begins dipping into his savings. If the market declines as he retires, with no income to replenish his losses, the retiree find himself in a financial hole he may not be able to climb out of. Older boomers have experienced what is arguably the best-case scenario: The S&P 500 has returned 269 percent since its March 2009 low. As a recent study in the Journal of Financial Planning shows, wealthy retirees can be very cautious about spending down their savings. This instinct, along with the stock market’s new record, suggests that many boomers are likely to end up with far more money than they know what to do with. Researchers followed the spending and investing behavior of 65- to 70-year-olds from 2000 to 2008. The poorest 40 percent of the survey respondents generally spent more than they earned, according to the study, which was funded by Texas Tech University. Those in the middle were able to keep their spending at about 8 percent below what they could have safely spent from pensions, investments, and Social Security. The wealthiest fifth, meanwhile, had a gap of as much as 53 percent between their spending and what they could have spent. For individuals, broad statistical averages like these are not very useful. As retirement looms, everyone should have a plan that will help them determine what happens if they get lucky and the market goes up, and what they can safely plan to spend if the market goes down. We have mentioned negative interest rates in the past. Let’s take a look at what it means to you. Central banks lower interest rates to encourage economic activity. The theory is that low interest rates allow companies to borrow money at lower costs, encouraging them to expand, invest in and grow their business. It also encourages consumers to borrow money for things like new homes, cars, furniture and all the other things for which people borrow money. It’s the reason the Federal Reserve has lowered rates to practically zero and kept them there for years. It’s also why the Fed has not raised rates; they’re afraid that doing so will reduce the current slow rate of growth even more. But if low rates are good for the economy, would negative interest rates be even better? Some governments seem to think so. Negative interest rates in Japan mean that if you buy a Japanese government bond due in 10 years you will lose 0.275% per year. If you buy a 10 year German government bond today your interest rate is negative 0.16%. Why would you lend your money to someone if they guaranteed you that you would get less than the full amount back? Good question. Perhaps the answer is that you have little choice or are even more afraid of the alternative. Brexit vote, and barely none with a negative yield in mid-2014. In Switzerland, government bonds through the longest maturity, a bond due in nearly half a century, are now yielding below zero. Nearly 80% of Japanese and German government bonds have negative yields, according to Citigroup. This leaves investors are searching the world for securities that have a positive yield. That includes stocks that pay dividends and bonds like U.S. Treasuries that still have a positive yield: currently 1.4% for ten years. However, the search for yield also leads investors to more risky investments like emerging market debt and junk bonds. The effect is that all of these alternatives are being bid up in price, which has the effect of reducing their yield. The yield on Lithuania’s 10-year government debt has more than halved this year to around 0.5%, according to Tradeweb. The yield on Taiwan’s 10-year bonds has fallen to about 0.7% from about 1% this year, according to Thomson Reuters. Elsewhere in the developed world, New Zealand’s 10-year-bond yields have fallen to about 2.3% from 3.6% as investors cast their nets across the globe. Rashique Rahman, head of emerging markets at Invesco, said his firm has been getting consistent inflows from institutional clients in Western Europe and Asia interested in buying investment-grade emerging-market debt to “mimic the yield they used to get” from their home markets. Clients don’t care if it is Mexico or Poland or South Korea, he said, “they just want a higher yield.” …. Ricky Liu, a high-yield-bond portfolio manager at HSBC Global Asset Management, said his firm has clients from Asia who are willing for the first time to invest in portfolios that include the highest-rated junk bonds. How and where this will end is anybody’s guess. 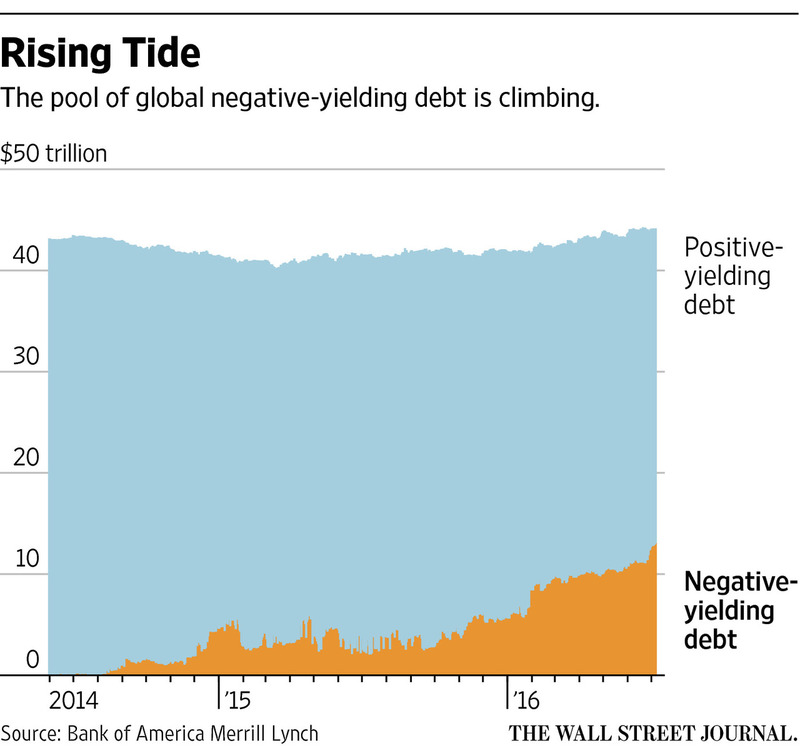 In our view, negative interest rates are an indication that central bankers are wandering into uncharted territory. We’re not convinced that they really know how things will turn out. We remain cautiously optimistic about the U.S. economy and are staying the course, but we are not chasing yield. We have a tendency to take a dispassionate view of world affairs. It helps us avoid getting caught up in the hype that the media sells when things happen. When the unexpected happens, as it so often does, the initial reports and the initial reactions are often the opposite of the truth and have little relationship to reality. We have some insight into European affairs for personal reasons and have always felt that the EU was an artificial construct in a continent that is home to so many disparate cultures. So we are not surprised that the whole rickety structure is showing signs of coming apart. But Europe has been the home of little countries and big countries for millennia and has thrived over that time. There’s no reason to think that the EU is either critical or even necessary. It has its uses but it also has its failures and it’s the failures that have grown larger over time. So finally, when put to a vote, the people on an island off the coast of Europe has decided it was time to declare its independence from the EU and reclaim their heritage. We also found the commentary from Jenna Barnard of Henderson Global Investors compelling and wanted to share it. While the result of the referendum “Brexit” last week may be the biggest political crisis in the United Kingdom since the Second World War, this is not a financial crisis in our view. Credit markets are not suggesting systemic risk at present as the banks are in a relatively healthy place due to rigorous regulation and stress testing over the last few years. Clearly the result is a significant blow to confidence / “animal spirits” in the short term and will put a least a temporary break on growth in the UK and perhaps Europe. Bank share prices have also been hammered and their willingness to lend remains muted. European companies are therefore likely to remain relatively conservative – more about dividends and conservative balance sheets than share buybacks /M&A. The Bank of England is planning to cut rates to 0% from 0.5% but the central bank doesn’t want to take them negative. We expect further credit easing – free money to the banks for mortgage lending (“funding for lending”), more QE possibly. We believe another central bank heading to the zero lower band fuels the global grab for yield. The issue at stake as of today is HOW the UK exits. There are soft and hard version of exit with soft (maintaining access to the free trade area) being the preferable version for the economy. Today the leading “leave” politician in the UK (and likely the next Prime Minister), former Mayor of London Boris Johnson, has written his weekly column for a national newspaper that suggests a very soft form of exit; along the lines of Norway and Switzerland i.e. retain access to the free trade area. To do this the UK would have to agree to free movement of labor (to be clear, not people, but the labor market; new migrants would need a job to come to the UK). We will continue to watch and advise you to events as they unfold. As we write these comments on Tuesday morning the US stock markets are up over 1% and the European markets are up over 3%. Reality is overtaking panic. If you have questions, don’t hesitate to contact us.